The land of opportunity. The USA. Every second person on earth wants to go there. With so much competition, how does one win? Perhaps, help can come from above. The Lord Venkateshwara at the village of Chilkur, 20 kms south of Hyderabad is popularly known as the Visa God. People throng the Chilkur Balaji temple to have their wishes fulfilled. A majority being US aspirants, hence the name. Last Thursday was cold and rainy – weather least expected in the 1st week of October in Hyderabad. A friend preparing for an exam asked us to accompany him to the temple. We left at 6 am, traveling on the newly built expressway system and passed small rocky mountains covered with monsoon greenery. And the huge Osman Sagar lake. Which brought back memories. December 2009. The effects of global recession were being felt in India. Jobs seemed scarce in our B-school. A few of my friends and me decided to visit Chilkur. Not much of a believer, I was more of the Karma type – what you sow is what you get. This temple has some typical features – there is no hundi, which means you can’t donate. You can’t prostrate in front of the deity. Once you enter, you will be amazed to see all kinds of people moving round and round the main temple (or doing pradakshina). The belief goes that a prayer and 11 rounds will make your wish come true. But you also need to come back and perform 108 rounds as a thank you gesture. You get small cards to keep a track of your rounds. The temple has lots of witty notices as the one mentioned above. The priest himself is pretty funny, he keeps the people motivated by cracking jokes in between chanting “Govinda!”. Even the rains and the cold couldn’t deter the devotees to come so early in the morning on a working day. The temple was more than half full. My friend completed the rounds and off we went to have a breakfast of idli accompanied with sweet milky tea. And then back home at 8.30 am. To head to office. God will help but we still need to do our part. 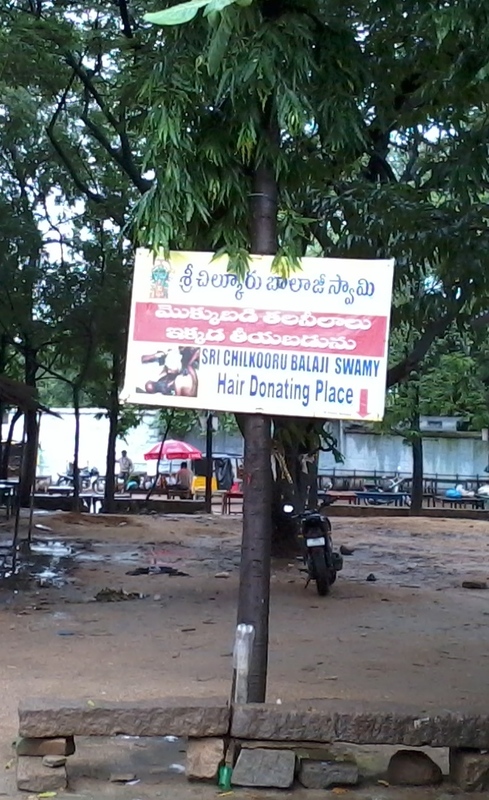 Photography not being permitted, the only pic I could capture was of this hair donating place outside the complex. 🙂 Chilkur Balaji temple, Hyderabad. I remember the 2009 part. U missed out on the speaking parrot outside the temple. And two eunuchs who were after a few of our friends’ lives. Truly speaking we were planning U.S.A trip but due to some reason it is not materializing… After reading ur article for once I even thought of visiting the Visa God !! How materialistic a devotee of God can be!!!! Great article focusing on the concept of middle path.